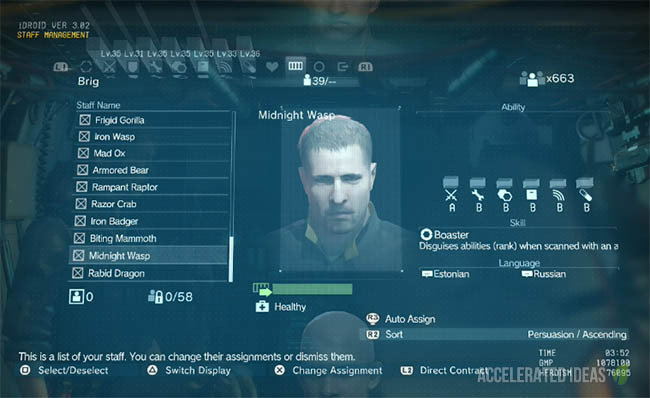 One of the early Side Ops in the Phantom Pain is titled "Extract the Highly Skilled Solider". It takes place in Afghanistan and becomes available not long after the first three missions. 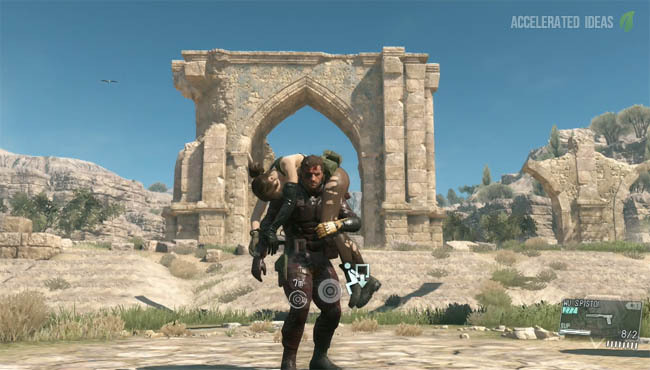 The hardest part of this mission is actually finding the skilled solider who is well hidden in the map. In this walkthrough I'll show you the exact location of the enemy, helping you complete this Side Op quickly and efficiently. 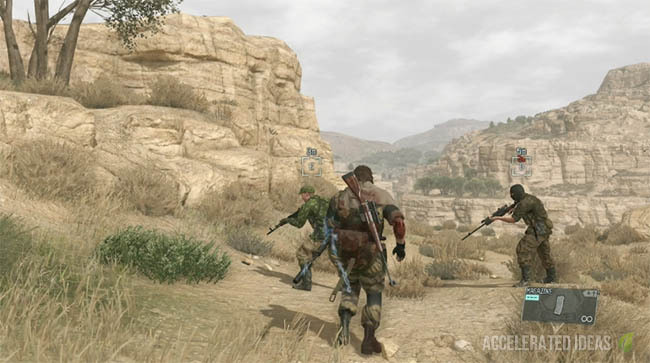 As with most missions in Metal Gear Solid 5 TPP, players are only given a rough area to search for objectives. This is shown on the map by a light blue circular area and the only thing you know is that the target is somewhere at this location. 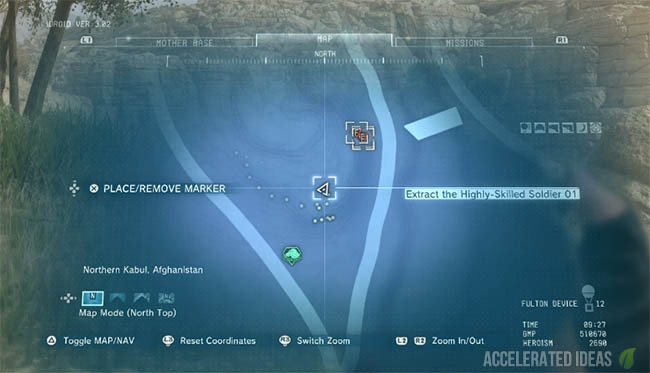 When it comes to Side Op 11, players need to find a highly skilled solider just south of Yakho Oboo Supply Outpost which is to the west of the Afghanistan map. There are three roads which form a triangle, with a fast flowing river dissecting areas of the map. Crossing the river isn't possible without a bridge and you'll die trying. The target is a sniper, who wears a black balaclava. Unfortunately, he never shoots from long range thus never revealing his location unless you're close enough. Although the mission is to find one skilled soldier, he's actually in a group of three, high up on a mountain top. To get to this location study the image above which shows the iDroid map - you will notice that the soldiers location is south of the mission area, just as the road dissects. Climb to the top of the small mountain and the three soldiers will be overlooking the road north. 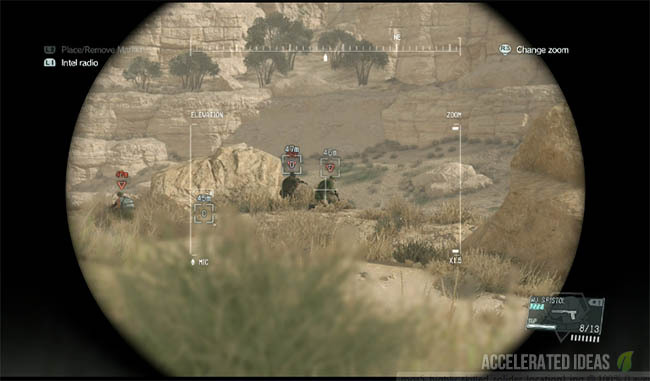 Use your binoculars to mark these targets, making it easier to watch their movements while you take cover from a nearby rock. These soldiers are smarter than some of the others you've encountered so far, so use the empty magazine to tempt them closer, while you remain hidden and out of sight. When the time is right leap out and use the Throw takedown to knock out the soldiers quickly and without retaliation. Then simply Fulton the men back to base to complete the mission and claim the rewards.